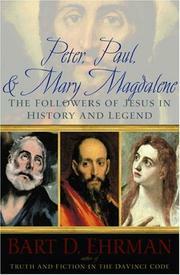 Historian of religion Ehrman takes readers on a tour of the early Christian church, illuminating the lives of three of Jesus' most intriguing followers: Simon Peter, Paul of Tarsus, and Mary Magdalene. What do the writings of the New Testament tell us about each of these key followers of Christ? What legends have sprung up about them in the centuries after their deaths? Was Paul bow-legged and bald? Was Peter crucified upside down? Was Mary Magdalene a prostitute? Ehrman separates fact from fiction, presenting complicated historical issues in a clear and informative way and relating anecdotes culled from the traditions of these three followers.--From publisher description.